Podalangai/ Snake Gourd, true to its name, looks like a snake, a green and long vegetable, but sometimes you see smaller versions of it too. First of all, you should know how to prepare this vegetable for cooking. Since it's a long vegetable, cut into palm-size lengths, slice it in the middle, scoop out the inner flesh with the seeds and discard it. I remember, the first time I cooked this vegetable for my husband, he was very skeptical about me throwing away the flesh and keeping the outer thick rinds, confusing me too, later I had to clarify it with a friend. Once you discard the inner flesh, you slice it. 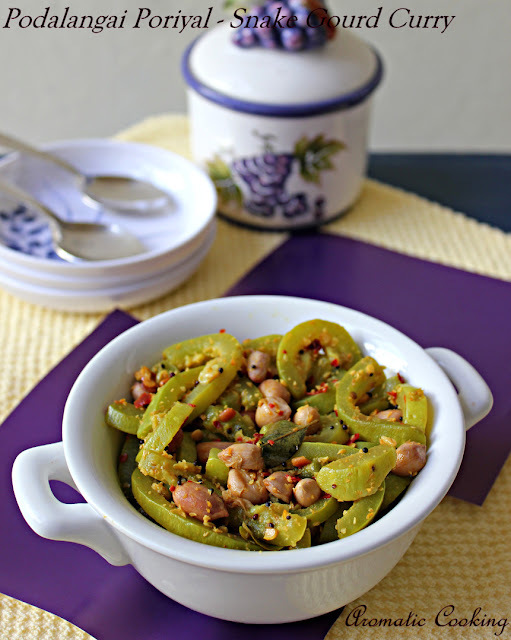 I have added some boiled peanuts for some extra taste, this goes well as a side dish with rice and dal or sambar..
Just coarsely grind the ingredients given under 'to blend', without adding any water and keep. 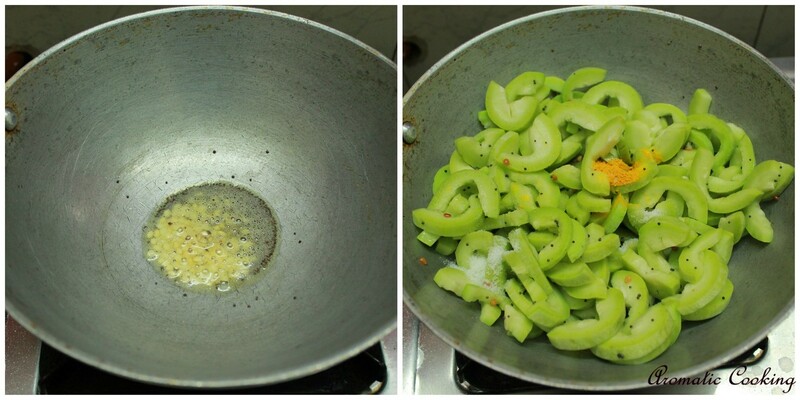 Heat some oil, add the mustard seeds and the urad dal, once it starts spluttering, add the asafoetida. 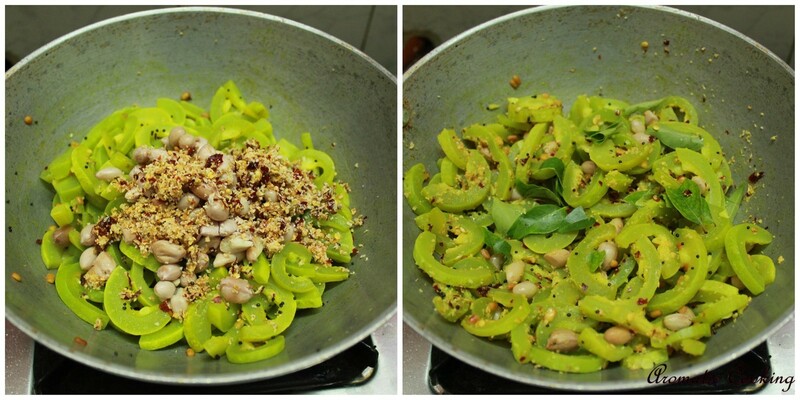 Mix and immediately add the sliced snake gourd pieces. Add 4 tablespoons of water, the turmeric powder and salt, reduce the heat, cover and cook till the vegetable is done and soft to the bite. 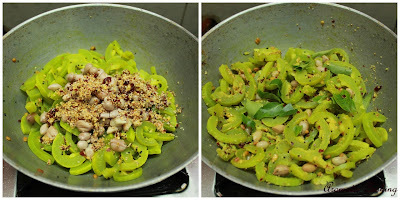 Now add the cooked peanuts and the ground mixture, keep mixing it for another 2 minutes, add the curry leaves, mix it one more time and serve. Goes well with both rotis or rice along with any dal. Snake gourd is available in Indian stores, also available in the frozen section. Can do the same curry with other vegetables like carrots, chayote. Dry raw peanuts is available throughout the year, just pressure cook them. another g8 combo with peanuts,yummy!! Poriyal looks fabulous and super inviting. Delicious poriyal love the addition of peanuts in there. I am missing fresh podalangai here. am not abig famn of snake guard but the addition of peanuts sounds super interesting! 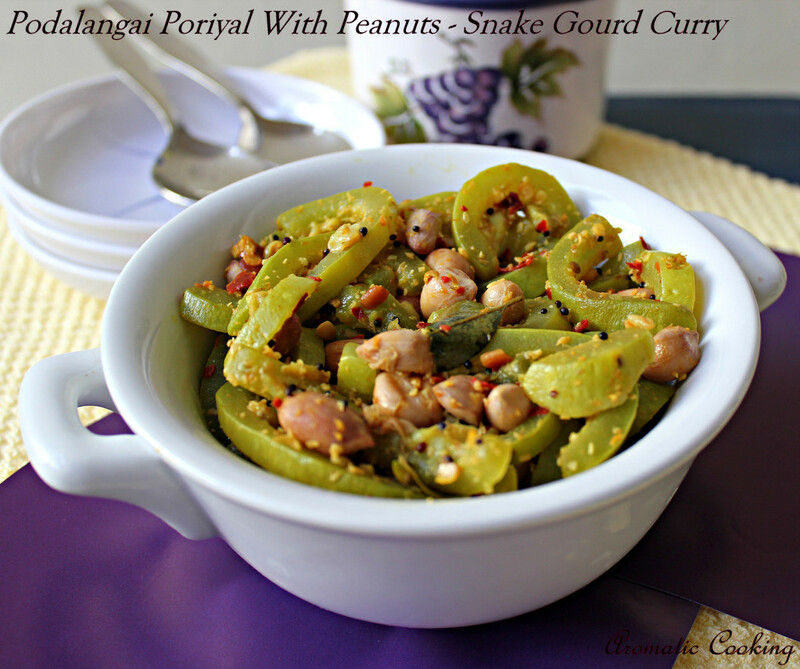 have not tasted snake guard, but sounds good with peanuts. i too like adding boiled peanuts to poriyals, my Grandma used to make this way...looks so yumm, inviting pics! Your photos (and dish) look so beautiful! Liked the addition of peanuts.